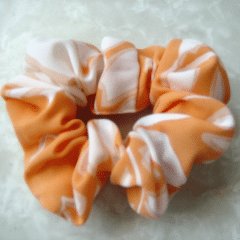 Making hair scrunchies is a great way to learn how to sew. It gives you practice sewing in a straight line, sewing close to an edge, as well as sewing by hand. All three are important in order to be able to sew garments and other sewing projects. 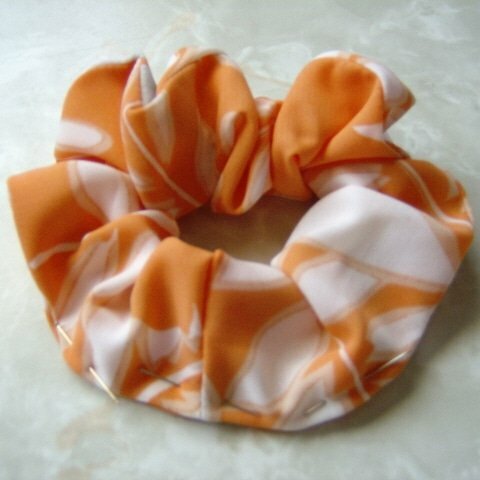 And the great thing about sewing hair scrunchies is that they do not have to be perfect because once they are wrapped around the hair, any flaws will most likely be hidden. Materials: A 6.5 inch stretchy elastic, A 24 by 5 inch piece of fabric. 1) Measure and cut a piece of fabric that measures at least 24 inches long and 5 inches wide. Cut a 6.5 inch piece of stretchy elastic and put aside. 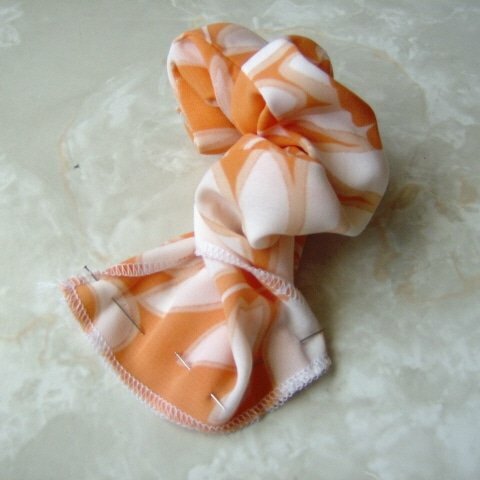 You can adjust the measurements of the fabric and elastic in order to sew a larger or a smaller scrunchie. 2) Take your material and serge around edges. If you don’t have a serger, use the over-lock stitch on your sewing machine. 3) Fold material in half lengthwise with the right sides facing. Pin in place and sew together leaving about 3 inches open on each end. You need the ends left open in order to have enough room to sew the two ends later. 4) Press the finished seam and continue pressing to the end, including the 3 inches that were left open in order to set the seamlines. This will help to make it easier for you later. 5) Turn the right side out with a bodkin, or a large safety pin will work just as well. 6) Slide the elastic through the fabric tube bunching the material as you go and making sure to keep the elastic from twisting inside. 7) Sew the two ends of elastic together making sure there are no twists in it. 8) Take the two ends of fabric and pin them together with right sides facing and seamlines open. Sew together. 9) With right sides facing out, press the new seamline. Then refold and press the previous seamline. Pin the open side seams together. 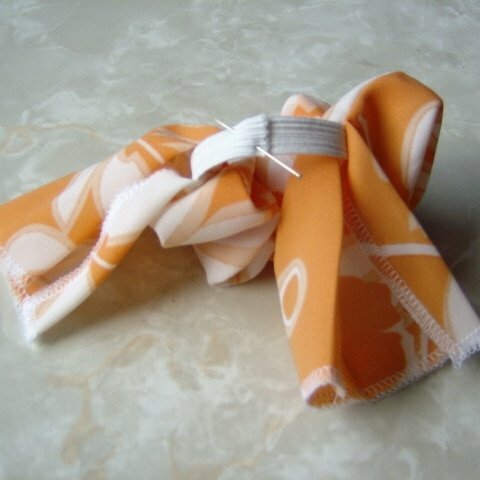 10) Now you can either use your sewing machine to close the scrunchie by sewing as close to the edge as possible. Or, you can hand stitch the seam with slip stitches. The stitches made with the sewing machine will be visible but the slip stitches will be invisible if done correctly.